We were established in 2016 and are currently producing one product under the brand name DAGZ. Several editions of the game are available... mini, table topper, game room, & custom bar. We love craft beer, so we started creating beautiful custom bar editions for our DAGZ games to add some gorgeous decor and tons more fun to our favorite breweries and taprooms. We love playing darts, pool, bags and horseshoes with our friends. We created DAGZ to have another option that is fresh, unique, takes up less space and is all-season, but is just as awesome and stimulating (and addictive). Whether it’s in your home, at a tailgate, at a graduation party, in your dorm room, or your local watering hole, DAGZ brings people together to share in laughs and good times through a little competition. DAGZ the concept was invented on a trip back from Riviera Maya, Mexico after enjoying a nice vacation including fun in the Sun and days of music by the Zac Brown Band. My name is Chris Carroll and I am the Principal owner of DAGZ. My family, friends and I are a social bunch of characters who love a little competition. With that said, we enjoy playing many of the outdoor games such as: horseshoes, bocce ball, bean bags, can jam, beers-bee, spike-ball and ladder ball. There’s been many a night that the halogen lights were busted out to keep the bean bag competition flowing. In fact, it is the constant encountering of natural elements like nightfall, rain, snow, and wind that inspired the invention of DAGZ. I wanted something that encapsulated the social competitive aspects of these outdoor games we knew and loved into something that is portable and could be used both indoor and outdoor. Shortly after arriving home from Riveria Maya I went to work on constructing a prototype of the game we now know and love called DAGZ. 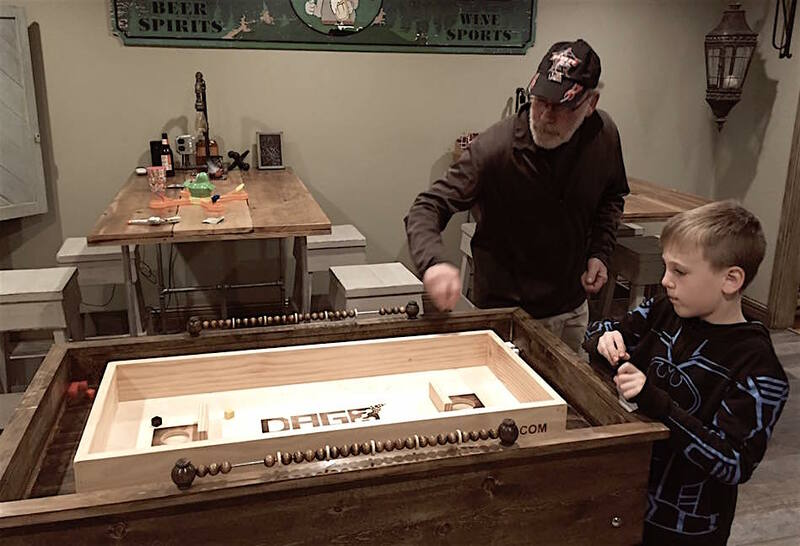 Funny story is that my wife, Jennifer, thought I was a little crazy and laughed it off as I was out in the garage tinkering around telling her that I invented a game and was trying to make it. That same evening my brother-in-law Joe and sister-in-law Shannon arrived for a visit. Initially, they thought I fell off my rocker too, but Joe stuck with me and helped me put the finishing touches on the first prototype. By now he was intrigued and couldn’t wait to try the game out for the first time. Once we started playing we didn’t stop until 4 hours later. We had established the number 1 and 2 ranked players in the world and unfortunately as the game inventor I had literally been beaten at my own game. Joe was ranked number 1 and I was number 2, although I did win the first official game for money which was a whopping $1.00. When we woke the following day I was dreaming about the possibilities of the game and whether others would like it too. For the next several weeks/months I pursued filing for a patent and testing my prototypes with family and friends. All the while we were searching for a name for the game. On a trip to my parents house for a family get together, my brother Mike and my nephew Mikey coined the name DAGZ. I give them both credit as I am not sure which truly had the idea first. The name was perfect as it embodied exactly what the category of game could be, Dice Angle Games (DAGZ). Thanks for reading my story. Ready to play?